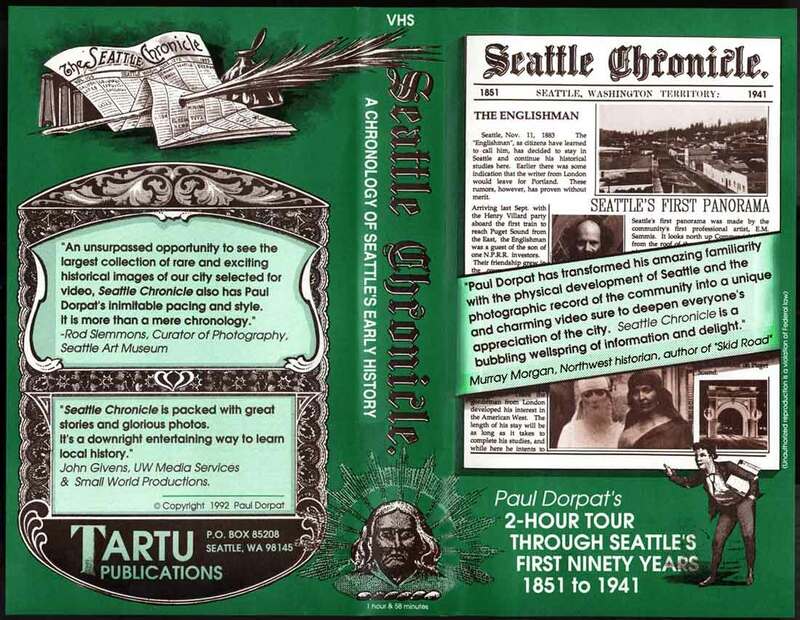 First released on VHS in 1992, ‘SEATTLE CHRONICLE,’ Paul’s acclaimed video tour through the first 90 years of Seattle history has been re-released with a new introduction on DVD. A real bargain (we think) – originally $29.95, now $20 + $3.50 S&H (lovingly handled by Paul himself). Here “himself” recounts the curious history of this production. Under the cover art included just below we have also inserted a scan of the formerly two sided flier that was folded in with the VHS tape. (You can still detect the fold creases.) This was introduced with the second “printing” or run of the tape, and includes some corrections – errata – that a few sensitive friends suggested. If I remember correctly those mistakes were the efficient or practical cause for including also an index. And I do enjoy making indexes because they are so bountiful. The introduction in the flier below also suggests that after many itinerate years of giving slide shows hither-thither it was time to gather my stones and build a presentable and secure fort: an illustated history of Seattle. Actually, the “time” was a telephone call from a teacher who taught teachers. The instructor at Seattle Pacific University wanted a teaching aid – other than a book – on local history and asked “Do you have one.” I anwsered, “No but I could make one quick enough.” The result was this two-hour production, which I can thankfully note was very popular for a time – before YouTube and cell phones and digital cameras and many other recreations. Seattle Chronicle also helped put veggies on the table for quite a while. Seventeen years ago the tape sold for $29.95 – it was a conventional price then, and the margin of profit was more than ever imagined by a free-lance community historian without the monthly support that comes with some portfolio and/or hardwood chair in a faculty lounge. (Imagine, inflation has been nearly 100% since then.) With the help of the KCTS videographer Tom Speer, my next door neighbor then, I videotaped a specially assembled slide show run on two projectors with a dissolve “unit’ between them. I purchased these machines used from another road show artist who was then on Jacob’s Ladder to some new technology for showing his happy Christian shows around the state. (In this I distinguish his shows from the less happy Christian shows we assocate with historical figures like Cotton Mather and Billy Sunday – all long before our time. Yes, I am imagining all this simply from the smiling exchange between us on my front porch – my cash for his projectors and dissolver. I have never seen his show.) Next, I added music (most of my own composition) and some contemporary footage (that “now-then” effect) shot with what was just good enough at the time: a Hi-8 video camera borrowed from another friend. By contemporary high-definition standards, then, this is not as slick in either technique or special effects as even your average endowed private school media production. But it is a pretty good story-telling and once you have taken the two hours – or however long you need to watch it all – you will have a pretty good feel for Seattle History and be better ready to read books (some of which we will also soon !!!SELL!!! here) and explore historylink. Finally, remember times are tough and don’t spend your money needlessly – unless you have lots of it, and then buy buy buy as if you were a digit on the providential invisiable hand that is suppose to keep this for the most part free economy in line or on track or out of the hole. Click the art below to enlarge it – and disregard the VHS graphic at the top of the cover art. That is merely an artifact of the old video tape. You are getting a DVD not a tape. Are these DVDs still available? I called Tartu Publishing and it says the number is disconnected, so I’m obviously skeptical to just send a check or use the PayPal link. I am very interested in purchasing one of these and if I like it, definitely a second or third for gifts.